An unaltered photocopy of your ORB, ERB, DD-214 or NG-22, OR other military issued document(s) authorizing your CAB authorization. NOTE: If the CAB is NOT LISTED on your DD-214, your DD-215, your 201A Award Report, or you do not have orders authorizing you the CAB you MAY NOT APPLY. Also, the CAB is NOT authorized and NOT retroactive to any person who was discharged BEFORE 18 Sep 2001. The CAB is retroactive to 18 Sep 2001 only for soldiers who are still on active duty. The CAB is NOT retroactive to any veteran (who is not currently on active, NG or reserve duty) who served prior to 18 Sep 2001. In other words, if you served in the Army (or in another Branch but was TDY'd or PCS'd to an Army unit) PRIOR TO 18 Sep 2001 you are NOT eligible to apply for the CAB. I. DESCRIPTION: A silver badge 2 inches (5.08cm) in width overall consisting of an oak wreath supporting a rectangle bearing a bayonet surmounting a grenade, all silver. Stars are added at the top to indicate subsequent awards; one star for the second award, two stars for the third award and three stars for the fourth award. II. SYMBOLISM: In keeping with the spirit of the Warrior Ethos, the Combat Action Badge provides special recognition to Soldiers who personally engage the enemy, or are engaged by the enemy during combat operations. The bayonet and grenade are associated with active combat. The oak wreath symbolizes strength and loyalty. III. 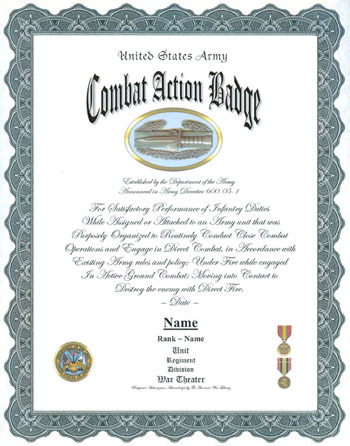 AWARD ELIGIBILITY: The Combat Action Badge (CAB) may be awarded by any commander delegated authority by the Secretary of the Army during wartime or the CG, U.S. Army Human Resources Command and will be announced in permanent orders. (1) The requirements for award of the CAB are Branch and MOS immaterial. Assignment to a Combat Arms unit or a unit organized to conduct close or offensive combat operations, or performing offensive combat operations is not required to qualify for the CAB. However, it is not intended to award all soldiers who serve in a combat zone or imminent danger area. a. Only one CAB may be awarded during a qualifying period. b. Second and third awards of the CAB for subsequent qualifying periods will be indicated by superimposing one and two stars respectively, centered at the top of the badge between the points of the oak wreath. (6) Retroactive awards for the CAB are not authorized prior to 18 September 2001, applications (to include supporting documentation) for retroactive awards of the CAB will be forwarded through the first two star general in the chain of command to CG, U.S. Army Human Resources Command, ATTN: AHRC-PDO-PA, Alexandria, VA 22332-0471. (7) Wear policy is contained in Army Regulation 670-1. (8) Soldiers may be awarded the CIB, CMB and CAB for the same qualifying period, provided the criteria for each badge is met. However, subsequent awards of the same badge within the same qualifying period are not authorized. IV. DATE APPROVED: On 2 May 2005, the Chief of Staff, Army, approved the creation of the CAB to provide special recognition to soldiers who personally engage, or are engaged by the enemy. HQDA Letter 600-05-1, dated 3 June 2005, announced the establishment of the Combat Action Badge. V. SUBDUED BADGE: Subdued badges are authorized in metal and cloth. The metal badge has a black finish. The cloth badge has olive green base cloth with the bayonet, grenade, oak wreath and border of the bar embroidered in black. VI. MINIATURE BADGES: A dress miniature badge, 1 1/4 inches (3.18 cm) in length is authorized for wear on the mess uniforms. A miniature badge, 1 3/4 inches (4.45 cm) is also authorized in lieu of the regular size badge. If you served with an Army unit in combat you may apply to the commander of the Army unit you served with for authorization to wear the CAB and have this award listed among your other authorized medals, badges and awards. Use form DA-638 to apply for CAB authorization. DA-638 may be processed either by the local command(er) or the Army unit served (faster). Discharged veterans who served after 11 September 2001 should use form DD-149 for processing through the Army Awards Branch. (See http://www.americanwarlibrary.com/htom.htm. A. AR 600-8-22, MILITARY AWARDS, 11 DEC 06. B. MEMORANDUM, ASSISTANT SECRETARY OF THE ARMY (MANPOWER AND RESERVE AFFAIRS), 24 JUN 08, SUBJ: PROPOSED CHANGES TO ARMY REGULATION (AR) 600-8-22. 1. THE PURPOSE OF THIS MESSAGE IS TO PROVIDE THE REVISED CRITERIA, APPLICABILITY, AND STANDARDS FOR AWARDING THE COMBAT INFANTRYMAN BADGE, COMBAT MEDICAL BADGE, AND COMBAT ACTION BADGE. 2. A PANEL OF SENIOR OFFICERS AND NONCOMMISSIONED OFFICERS MET TO DISCUSS PROPOSED CHANGES TO THE CRITERIA FOR AWARDING COMBAT BADGES FOR PERFORMANCE IN THE COMBAT THEATER. THE PANEL'S RECOMMENDATIONS WERE APPROVED BY THE ASSISTANT SECRETARY OF THE ARMY (MANPOWER & RESERVE AFFAIRS) ON 24 JUNE 2008. 3. CHANGES ARE EFFECTIVE IMMEDIATELY AND RETROACTIVE TO 18 SEPTEMBER 2001. 4. THESE CHANGES WILL BE INCORPORATED INTO AR 600-8-22, MILITARY AWARDS, 11 DECEMBER 2006. (A) CHANGED TO READ: "A SOLDIER MUST BE PERSONALLY PRESENT AND UNDER FIRE WHILE SERVING IN AN ASSIGNED INFANTRY OR SPECIAL FORCES PRIMARY DUTY POSITION, IN A UNIT ENGAGED IN ACTIVE GROUND COMBAT, TO CLOSE WITH AND DESTROY THE ENEMY WITH DIRECT FIRES. IMPROVISED EXPLOSIVE DEVICES (IEDS), VEHICLE-BORNE IEDS (VBIEDS) AND THE LIKE ARE DIRECT FIRE WEAPONS. WHILE NO FIXED, QUALIFYING DISTANCE FROM AN EXPLOSION OF THESE DEVICES CAN BE ESTABLISHED, COMMANDERS SHOULD CONSIDER THE ENTIRETY OF THE COMBAT SITUATION WHEN CONSIDERING AWARD OF THE CIB." (B) SUMMARY OF CHANGE: WHILE NOT QUALIFYING BY THEMSELVES, ENGAGEMENT BY DIRECT FIRE WEAPONS, INCLUDING IEDS, VBIEDS AND THE LIKE, SHOULD BE CONSIDERED IN RECOMMENDATIONS FOR AWARD OF THE CIB. (A) CHANGED TO READ: "SUBSEQUENT AWARDS OF THE CIB ARE NOT AUTHORIZED FOR THE SAME QUALIFYING PERIOD, AS OUTLINED ABOVE. THE CIB MAY BE AWARDED BY THE FOLLOWING INDIVIDUALS: (1) CURRENT AWARDS. THESE AWARDS MAY BE AWARDED BY USA HRC, ATTN: AHRC-PDP-A AND ARMY COMMANDERS IN THE GRADE OF 0-6 AND ABOVE." (B) SUMMARY OF CHANGE: CIB APPROVAL AUTHORITY MAY BE DELEGATED TO ARMY COMMANDERS, COLONEL AND ABOVE. (C) SOLDIERS ARE REMINDED THAT ONLY ONE CIB MAY BE AWARDED FOR GWOT, REGARDLESS OF THE NUMBER OR LOCATION OF DEPLOYMENTS. (A) CHANGED TO READ: "ON OR AFTER 18 SEPTEMBER 2001: (A) MEDICAL PERSONNEL ASSIGNED OR ATTACHED TO OR UNDER OPERATIONAL CONTROL OF ANY COMBAT ARMS UNITS OF BRIGADE OR SMALLER SIZE, WHO SATISFACTORILY PERFORM MEDICAL DUTIES WHILE THE UNIT IS ENGAGED IN ACTIVE GROUND COMBAT, PROVIDED THEY ARE PERSONALLY PRESENT AND UNDER FIRE. RETROACTIVE AWARDS UNDER THESE CRITERIA ARE NOT AUTHORIZED FOR SERVICE PRIOR TO 18 SEPTEMBER 2001." (B) SUMMARY OF CHANGE: THE LANGUAGE, "NOT TO INCLUDE AVIATION" HAS BEEN DELETED FROM THE POLICY, PERMITTING MEDICAL PERSONNEL ASSIGNED, ATTACHED OR OPCON TO COMBAT AVIATION UNITS TO QUALIFY FOR THE CMB, IF OTHER CRITERIA ARE MET. RETROACTIVE AWARDS WILL NOT BE AUTHORIZED FOR SERVICE PRIOR TO 18 SEP 01. (A) CHANGED TO READ: "THE AWARD APPROVAL AUTHORITY FOR THE CMB IS THE SAME AS THE CIB (SEE PARAGRAPH 8-6G ABOVE)." (C) AS WITH THE CIB, ONLY ONE AWARD OF THE CMB IS AUTHORIZED FOR GWOT, REGARDLESS OF THE NUMBER OR LOCATION OF DEPLOYMENTS. (A) CHANGED TO READ: "THE CAB MAY BE AWARDED BY ANY COMMANDER DELEGATED AUTHORITY BY THE SECRETARY OF THE ARMY DURING WARTIME OR THE USA HRC, ATTN: AHRC-PDP-A. EFFECTIVE 3 JUNE 2005, COMMANDERS DELEGATED AUTHORITY TO AWARD THE CAB MAY FURTHER DELEGATE AWARD AUTHORITY TO COMMANDERS IN THE GRADE OF 0-6 OR ABOVE. AUTHORITY TO AWARD THE CAB MAY ALSO BE DELEGATED TO REGIONAL MEDICAL CENTER COMMANDERS. THE CAB WILL BE ANNOUNCED IN PERMANENT ORDERS. AWARD OF THE CAB IS NOT AUTOMATIC AND WILL NOT BE AWARDED SOLELY ON THE BASIS OF AWARD OF THE PURPLE HEART." (B) SUMMARY OF CHANGES: CAB APPROVAL AUTHORITY MAY BE DELEGATED TO ARMY COMMANDERS, COLONEL AND ABOVE. CAB APPROVAL AUTHORITY MAY ALSO BE DELGATED TO REGIONAL MEDICAL CENTER (RMC) COMMANDERS. THE CAB WILL NOT BE AUTOMATICALLY AWARDED TO RECIPIENTS OF THE PURPLE HEART. (2) DELEGATION TO RMC COMMANDERS. (A) SUBSEQUENT TO APPROVAL OF THE PANEL'S RECOMMENDATIONS, THE ASA(M&RA) DELEGATED CAB APPROVAL AUTHORITY TO RMC COMMANDERS. (B) SUMMARY OF CHANGE: RMC COMMANDERS MAY NOW APPROVE THE CAB FOR THEIR PATIENTS. THIS AUTHORITY MAY NOT BE FURTHER DELGATED. (A) CHANGED TO READ: "RECOMMENDATION AND AUTHORITY TO AWARD. a. RECOMMENDATIONS FOR AWARDS OF BADGES WILL BE SUBMITTED BY MEMORANDUM OR DA FORM 4187 THROUGH COMMAND CHANNELS TO THE COMMANDER AUTHORIZED TO MAKE THE AWARD. 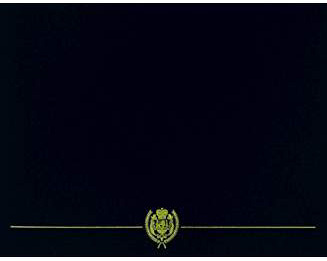 b. BADGES MAY BE APPROVED AND AWARDED IN THE FIELD ONLY BY THE COMMANDERS AUTHORIZED TO AWARD THE RESPECTIVE BADGE AS SPECIFIED IN PARAGRAPHS BELOW. c. ARMY COMPONENT COMMANDERS DOWN TO LTG WHO ARE DELEGATED COMBAT BADGE APPROVAL AUTHORITY MAY APPROVE EXCEPTIONS TO COMBAT BADGE POLICY TO WAIVE THE CRITERIA IN INDIVIDUAL CASES WHERE THE INTENT OF THE BADGE HAS BEEN MET. d. AWARD OF BADGES TO ACTIVE ARMY PERSONNEL THAT CANNOT BE RESOLVED BY LOCAL COMMANDERS WILL BE FORWARDED THROUGH COMMAND CHANNELS TO USA HRC, ATTN: AHRC-PDP-A, 200 STOVALL ST., ALEXANDRIA, VA 22332-0471.
e. THE PROCESSING OF ORDERS FOR AWARD, RESCISSION, REVOCATION, AND REINSTATEMENT OF ARMY BADGES AND TABS IS IN PARAGRAPHS 1-26C AND 1-30." (B) SUMMARY OF CHANGE: EXCEPTION TO POLICY AUTHORITY FOR COMBAT BADGES IS DELEGATED TO ARMY COMPONENT COMMANDERS DOWN TO LTG WHO HAVE BEEN DELEGATED COMBAT BADGE APPROVAL AUTHORITY. THESE COMMANDERS ARE IN THE BEST POSITIONS TO TAKE INTO ACCOUNT SPECIAL SITUATIONS AND MAKE DETERMINATIONS ON THE QUALIFICATION FOR BADGES. Rep. Brown-Waite (R-FL): Expands the eligibility for the Army Combat Action Badge to those soldiers who served during the dates ranging from December 7, 1941, to September 18, 2001. The costs to procure the badges would be borne by these individuals not the military.